The first hill was a gentle slope, the second hill long and twisty. Before we had a chance to catch our breath we were speeding down a third hill, a short but steep run. Wham! Bam! Thank you Ma'am! No time to stop and chat. On the backside of Corsair Ski Trail we were flying through the woods, using the momentum from one hill to climb the next, expending little or no effort. This wasn't skiing, it was a roller coaster ride. "We got rhythm now," said Gary Nelkie as we flew past another yellow caution sign and braced ourselves for the downhill run that followed. Some people ski Corsair Trails because of its location, a mere 90-minute drive from Saginaw, even less from Bay City. Some come because there's snow here and none in Ann Arbor or Jackson. 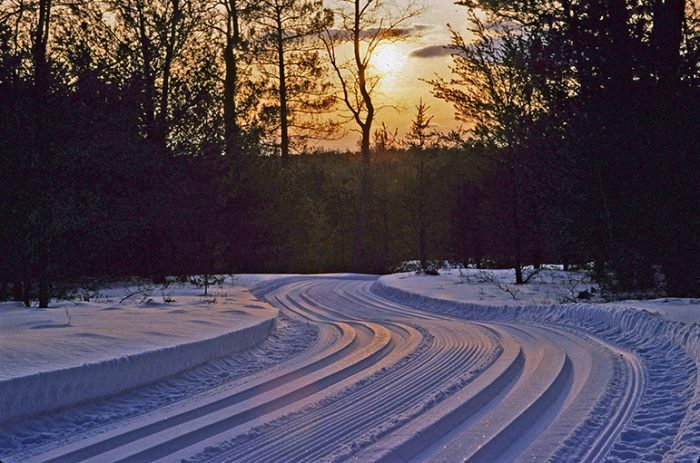 But the best reason to spend a day or even a weekend in this corner of the Huron National Forest is because no other groomed trail system in the Lower Peninsula is as extensive or better laid out than Corsair. 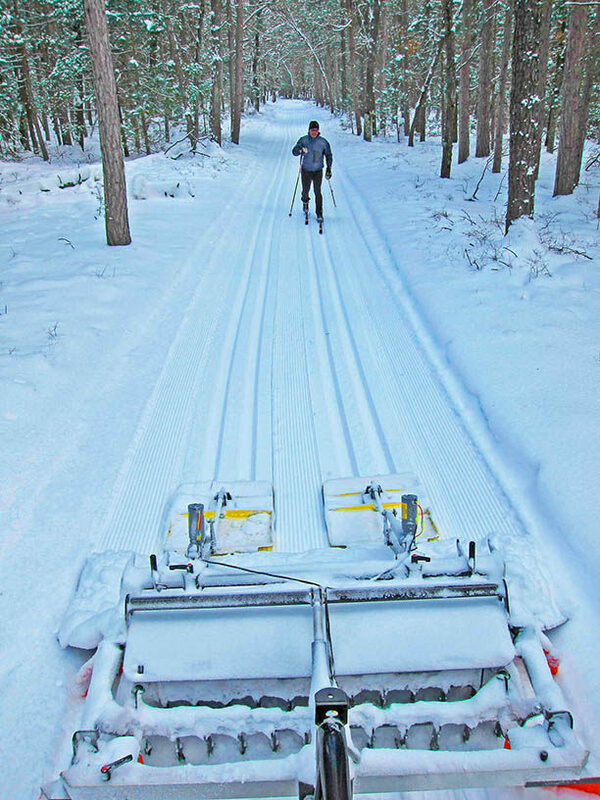 "This section is one third up, one third down and one-third level, which creates perpetual motion for skiing," said Nelkie of Nordic Sports in Tawas City. "You can ski forever here without getting tired." And skiers are trying. 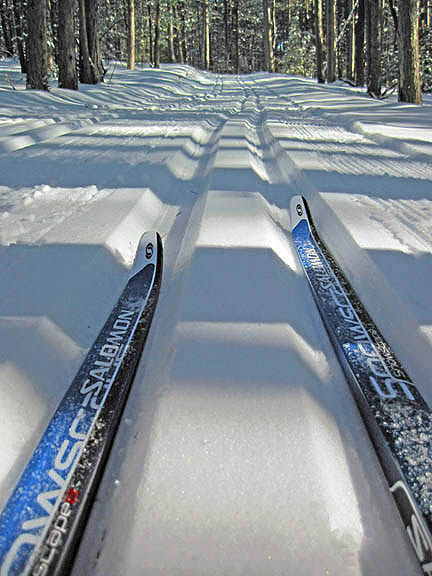 This network of trails registers 25,000 users annually, making it one of the most popular Nordic ski area in the state. It might also be one of the oldest. Skiing in the area dates back to the mid-1930s when Silver Valley Winter Sports Park was built and included a tow-rope for downhill skiing, a toboggan run and a short loop for cross country skiing. The park closed in 1963 but 10 years later Nelkie and a handful of other locals returned to Silver Creek and cut a Nordic trail beginning from a roadside picnic area called "Corsair." 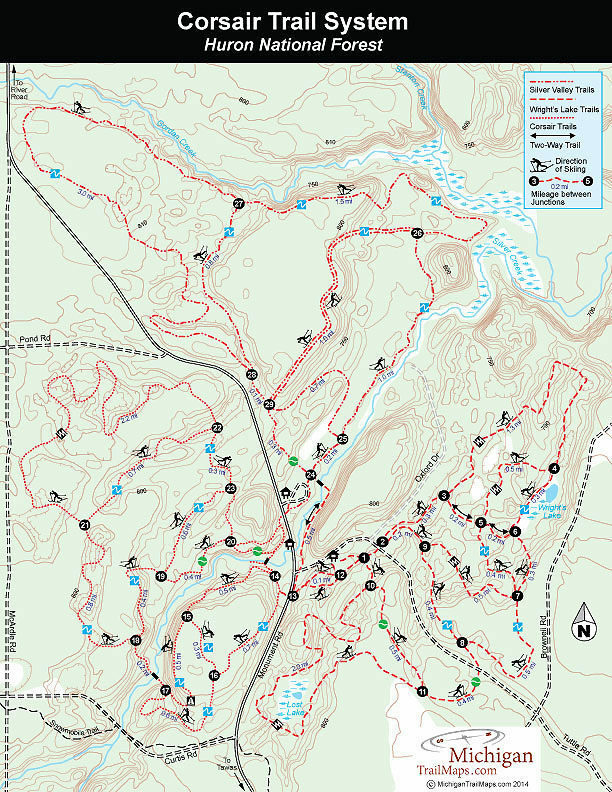 Since 1974, the trail system has grown from two miles to a 26-mile network of three interconnected areas, each with its own trailhead and parking lot; the Corsair Trails, Silver Valley Trails and Wright’s Lake Trails, the most challenging segment by far and the only one groomed for skate skiing. The most popular trails are the original ones, Corsair, now an 8-mile system on the west side of Monument Road. With Silver Creek bisecting the interior, Corsair is also a scenic trail system that is rated intermediate in difficulty and double-tracked for classic skiing. The beauty of the Corsair section are the rolling red and jack pine forests that the trails wind through. The layout were designed as one third uphill, one third level, one third downhill to create a physical balance between exertion and rest. Thus the numerous hills make for almost perfect skiing, when at times it's possible achieve that "perpetual motion." In the world of Nordic skiing, effortless striding is as close to the state of Zen some of us will ever get. A popular tour is a 5-mile loop that begins from the trailhead by crossing Silver Creek and skiing the gently rolling trail through large pines to post No. 14 and No. 15 and onto post No. 17 reached after a long downhill. You then cross Silver Creek again on log bridge between post No. 17 and No. 18. This is perhaps the most picturesque spot in the entire combined trail system. Silver Creek flows under a canopy of white cedar trees as it gurgles and swirls around snow-covered ice and encrusted fallen trees. A few notable downhill runs will provide some high speed thrills on the Corsair trail. You climb to post No. 18, reached at Mile 1.4, with more rolling forested terrain encounter to post No. 21. The far outer loop, the 2.2-mile segment from post No. 21 to No. 22, is the only one rated Most Difficult. The black diamond rating is for several downhill runs but all are straight and well-marked. The final downhill is the most exciting run, a straight drop that plummets into a narrow valley and swoops right back up the opposite side to post No. 22, reached at Mile 4.4. The easy skiing resumes with rolling, wooded terrain through post No. 23 to post No. 20, where you can quickly return to the trailhead parking lot or extend your outing by venturing across Monument Road to the Silver Valley Trails. On the east side of Monument Road is Silver Valley, a 9.7-mile, three-loop system designed for beginner skiers and double-tracked for classic skiing. Opened in 1986, this is the newest segment of Corsair Trails but it’s parking lot lies next to the former Silver Valley Winter Sports Park, where some of the earliest skiing in Michigan took place. Buried in the Silver Valley is Frank Eaton, a Civil War veteran in the Michigan Calvary under General George Armstrong Custer and a son-in-law of the Coursers, who homesteaded at the Corsair trailhead in 1860-70s. Eaton’s military tombstone sits on top of a ridge 250 yards from post No. 25. 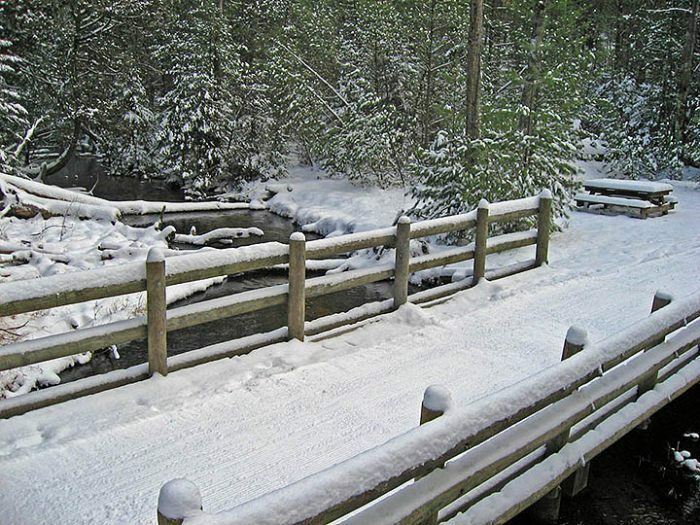 Bordered by Silver Creek to the east and Gordon Creek to the north, Silver Valley trails meander through a gently rolling, pine forests, offering the easy terrain for beginners, older skiers or those who looking enjoy long peaceful strides and carefree skiing. The outside perimeter of the system is a 6.1-mile outing that includes a very scenic stretch along the banks of Silver Creek between posts No. 24, No. 25 and No. 26, reached at Mile 1.2. More elevation with climbs and downhill runs is encountered just before post No. 26 and No. 27 but the effort is rewarded with views of Gordan Creek valley below. Half of the loop is the 3-mile segment between posts No. 27 and No. 28, reached at Mile 5.7. The final leg to the trailhead is a mostly an easy downhill run of less than half mile. Accessed from a trailhead along Tuttle Road is Wright's Lake, an 8.2-mile system with a 6-mile outer loop that winds around two lakes. Groomed with a single track and a skating lane, these trails are laid out in a hilly hardwood forest and are the most lightly used section, due to the area’s most challenging runs and the steepest hills. The small inland lakes are scenic but because of direction of travel, you have to ski the system in a figure 8 pattern to include both of them. From post No. 1 at the trailhead you can ski to post No. 10 and then around Lost Lake to post No. 11, reached at Mile 2. This is a scenic section rated Most Difficult because it meanders into the ridges that surround the small lake. From post No. 11 you cross Tuttle Road and then continue on to post No. 8, No. 9 and No. 2, reached at Mile 3, to begin the upper half of the figure 8. More elevation is encountered between post No. 3 and No. 4 including a long, fast downhill occasionally referred to as Powerline Hill. You bottom out to a quick right turn and then ski rolling terrain through post No. 4 and past Wright’s Lake to post No. 6. The outer loop continues to post No. 7 and post No. 8, reached at Mile 5.4, where you backtrack an earlier segment to post No. 9 and No. 2. Here you head left to cross Tuttle Road and quickly reach the trailhead. All three trailheads have parking vualt toilets and information signs. The Corsair Trailhead also has a log cabin warming shelter that is open on the weekends in the winter. Ski equipment can be rented and reserved in advance at Nordic Sports (989-362-2001; www.n-sport.com) in East Tawas. For a list of area lodging or a snow report contact the Tawas Area Chamber of Commerce (800-558-2927; tawas.com). 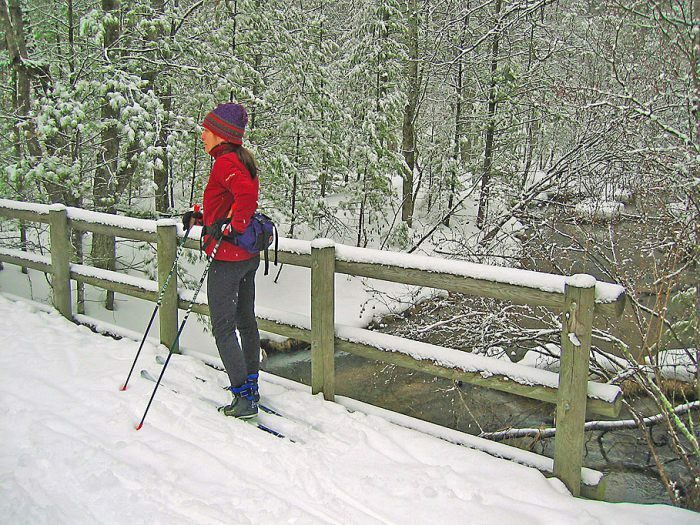 Corsair Trails is open year-round for cross-country skiing, mountain biking and hiking. Nordic skiers should consider purchasing a trail button from the Corsair Trail Council through Nordic Sports (989-362-2001; www.n-sport.com). Everybody should donated generously in the donation tube at each trailhead. The ski area is 8 miles northwest of Tawas City. Head west of Tawas City on M-55 briefly and then north on Wilber Road. Ski signs will lead you onto Monument Road and to the various trailheads. For more information on Corsair Trail System contact the Huron Shores Ranger District at (989-739-0728) or the Corsair Trail Council through Nordic Sports (989-362-2001; www.n-sport.com).